I love when I find a recipe for something that my whole family can enjoy and it is halfway healthy! These larabars are really good and I am so glad I found the recipe (thank you Fem Fusion). I honestly have never thought to try dates, they are ugly looking, like raisins! 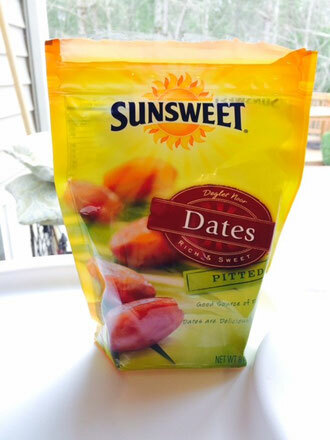 I prefer to use Medjool dates but for this batch I tried a cheaper version, the Sunsweet Dates I found near the raisins at the grocery store. If you are staying away from sugar then this is not an ideal recipe but at least dates are a natural sugar. 5-6 dates = 26g of sugar! This recipe calls for 1 cup of dates which is about 10 dates by my wonderful measuring skills! 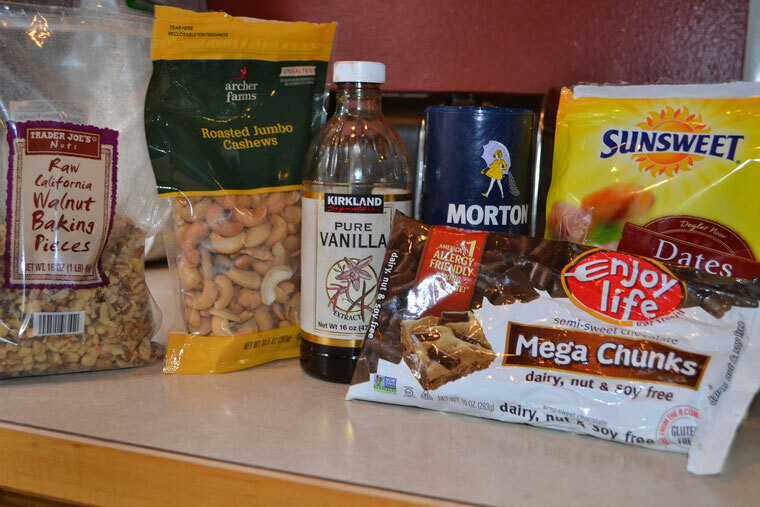 The rest of the recipe is made up of nuts, vanilla, sea salt, and chocolate chips (as little or as many as you wish, obviously they add to the sugar content). The combination of flavors really make this an appealing snack. They are super soft, chewy, and do not crumble which I love for my kids. Like I said, my entire family enjoys them and 1 batch (8 bars) only lasts me 2 days tops. They do not take long to whip up but be aware they need to set in the fridge for at least 2 hours before cutting. I try to make them along with dinner so they are ready for the next morning. Chop the dates in half. Measure out the cashews and soak both the dates and cashews in the same bowl of water for 10 minutes. While the dates and cashews are soaking I highly recommend you toast the pecans or walnuts, pecans especially. It really brings out the flavor. I simply throw them in my skillet and constantly stir them over medium heat. Once I start to smell the goodness I pour them in a bowl to cool a bit then blend them into tiny chunks in the food processor. 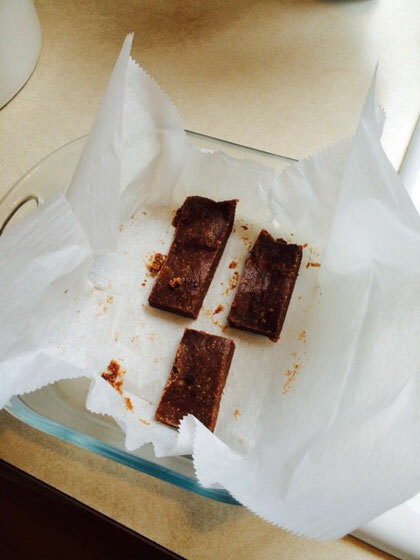 You can skip the toasting if you are short on time and the bars are still yummy! 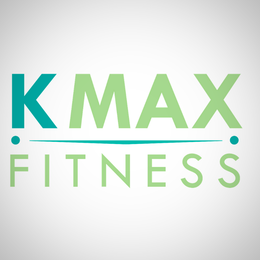 Once the 10 minutes of soaking is up and you have blended the walnuts or pecans, drain the dates and cashews and simply combine all the ingredients (minus the chocolate chips) in the food processor. The photo below is pre-blending. Blend it up until a ball forms (hopefully). Half the time I get the ball and the other half I do not but it seems to still work regardless. Sidenote, I am not going to pretend I am a great chef or baker because I am not so many of my recipe posts will just tell you how I do it and there could be a much better way that I have no idea about. I am teaching myself along the way which is how I learn best. If I get the ball I make a well in the center and pour in the chocolate chips. If the ball does not form I just pour in the chocolate chips and pulse a few times to combine it all. It will be gooey and sticky when all combined. 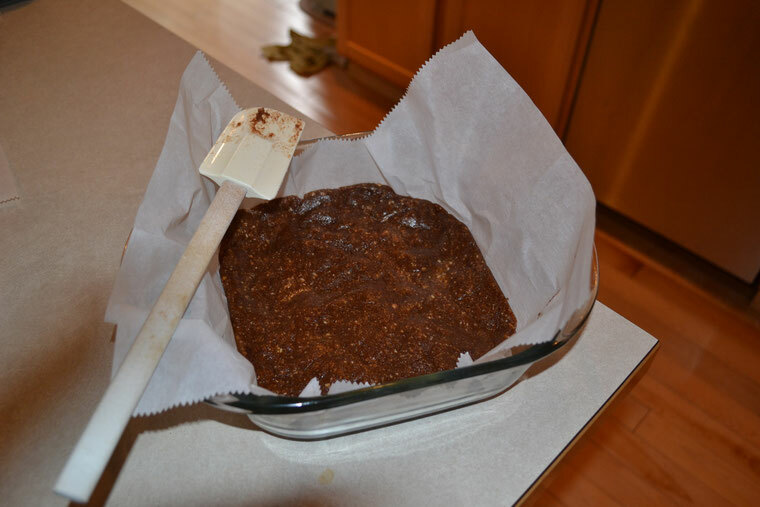 Spoon out the gooey mess onto a sheet of parchment paper and use some parchment paper to flatten them out. I spread them out to 8 x 8 and place them in my 8 x 8 glass dish to put in the fridge for a few hours or overnight. I do not cover them. Over time in the fridge if you do not cover them they tend to get a little crusty on the top so I recommend after a day or 2 covering them. Above is the finished product after I have pressed the top down and spread it out in my 8 x 8 glass dish. I put this in the fridge exactly as is and then when it is set (again a few hours to overnight) I make 8 bars out of it. You can see the size in this photo, only 3 are left and I made these this morning! So, there you have it! Yummy chocolate chip larabars! I hope you like them as much as we do here in the Maxwell household. Below is the recipe and directions without the photos. 1. Chop the dates in half and measure out the cashews and place them in a bowl of water to soak for 10 minutes. 2. While they are soaking you can choose to toast the pecans or walnuts to bring out their flavor or you can skip this step. Regardless which you choose (I enjoy toasting them over medium heat), blend them in the food processor until they are tiny chunks and leave them in there. 3. 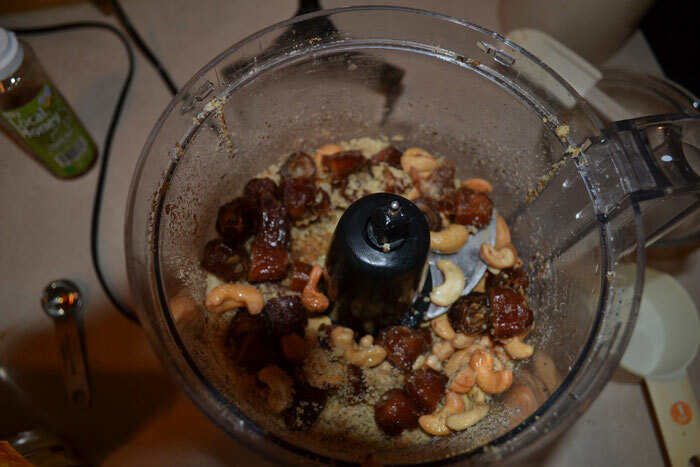 Drain the dates and cashews well and place in the food processor. 4. Combine all the ingredients (minus the chocolate chips) in the food processor and blend until a ball forms scraping the sides from time to time. It does not take too long to blend this up. Sometimes I do not get the ball and it still works for me but I am told the ball means you did it all right. No idea why I do sometimes and other times I do not. 5. Once it is all combined and if you get the ball formed you can make a well in the ball and add in your chocolate chips. If the ball does not form you can simply add the chocolate chips to the food processor. I pulse it up a few times and and it is good to go. I like chunky chips so I don't blend it that long but you can definitely blend it to your liking. 6. Spread out a piece of parchment paper on your countertop and spoon out the dough. I then use another piece of parchment paper to press it out to a 8 x 8 square. I then place the square in my 8 x 8 baking dish on the bottom piece of parchment paper in the fridge for a few hours to overnight to set. 7. Once set, I cut 8 bars and enjoy!